.014 Diameter, 21 Strands of stainless steel wire covered by a strong, flexible nylon coating, 30 feet per spool. 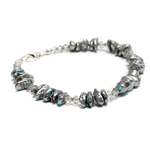 Ideal for lighter glass beads and semi-precious, seed beads and fresh water pearls. Test Strength 10 Lbs. * When using a cutter for beading wire, we suggest reserving one of your cutters just for your beading wire, such as the Xuron Tapered Flush Cutter.